My blog reader is overflowing with blogs I love to read and I have had to break them up into categories to work my way through them. I figure it is a bit like a magazine in that I buy home magazines, crafting magazines, cooking mags, mags for the articles etc etc so my reader reflects a similar sort of system. Oh trust me there are more categories than that. I like things to be categorised so when I get some time to sit down to read some blogs I go to whichever folder tickles my fancy at that particular moment. Now for ages I have wanted to do a blog roll on my blog. I used to have one, but then I pulled it down because I was always so worried about offending someone who wasn't on it. The reality is with so many blogs in my reader, I couldn't possibly list them all and so there in lies the problem - who do I choose to include on my Blog roll? Well I had to do something as there are so many gorgeous blogs that give me so much enjoyment and I want everyone to know who they are and if they haven't yet had the pleasure of discovering these blogs themselves, well then I want to introduce them to a fabulous new read. It's also kind of my way of saying thanks to those blogs that give me so much joy. So I came up with the idea of every week for the next few weeks, sharing with you guys what I am reading through a post on my Blog and after every one of these posts I will add those blogs to a list on my sidebar. Kind of like an ever expanding blog roll. I will feature the blogs in the categories that I file them under in my reader (by the way I use Feedly to read my blogs). And so that brings me to today's list of blogs. These blogs are from the folder I call My Morning Cuppa. 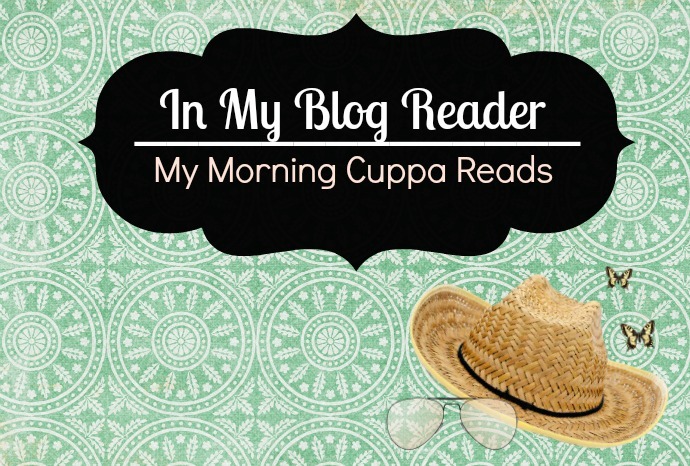 Some of them actually fall under a few categories in my reader but these are a selection of just some of the blogs I LOVE to read everyday as I drink my morning cuppa. How do you organise your blog reading? Do you use a reader?